When planning a trip you’ll certainly surf the web a bit. You should check in with National Geographic, check out some forums where you can talk to other travelers and get advice, and talking with an experienced travel agent is a good idea as well. Whats hot in the Southern Hemisphere? Check out the New Zealand Herald to find out what people from Auckland to Dunedin are talking about. Another simple thing to do is to find the local newspaper for your destination online and read up on what’s going on there. It’s an easy way to get weather reports, find out about local festivals or events you may want to attend, or just to get a feel for what the people there are talking about. It’s much easier to strike up a conversation with locals when you’re able to ask them about a recent concert, important court case, big sporting event, or just something funny you saw (“What’s the deal with that surfing poodle?”). Her bag isn't bigger on the inside. It just seems that way. When it comes to packing your clothes, how do you roll? Lengthwise, top to bottom, one pant leg at a time? A recent New York Times article gave tips from flight attendant Heather Poole on how she packs enough into her carry-on bag to last 10 days. Who would know more about packing than someone who flies for a living, right? Her main tip is to roll clothes, don’t fold them. I started rolling my clothes a few years ago, after seeing the tip on “Oprah” (What? She can be helpful sometimes.) and it’s served me well across Europe and Australia. Rolling reduces wrinkles, makes the most of your space, and whenever I pick up a fragile souvenir, I find putting it in between my rolled clothes gives it good protection for the journey home. 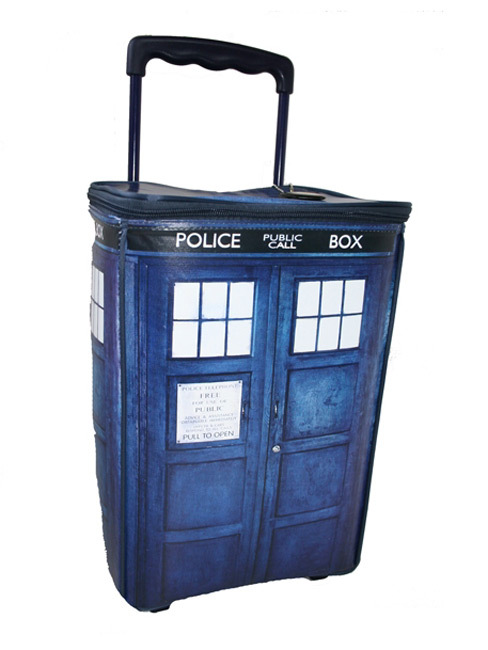 This bag might actually be bigger on the inside. 1. Put your socks, underwear, gloves and other small clothing items into big zip bags. If you have to find clothes in a hostel, in the dark, it will be easier to reach in your bag and find one big plastic bag than to hunt for two matching socks that have gone their separate ways. 2. Pack a couple of empty plastic bags when you begin and use them for dirty laundry or wet towels as you go. It will keep your clean clothes from being tainted by travel grime and when you have time to do laundry, you just have to grab the “dirty” bag and go. 3. Plan mix-and-match outfits. No matter how cute that one top is, if it only goes with that one skirt and one pair of shoes, forget it. If you can bring maybe five tops and three bottoms that all work together, you can layer and swap items so that you aren’t always wearing the exact same thing, but aren’t lugging around your full closet either. 4. Keep your itinerary in mind. If you’re hitting London, Paris and Barcelona just to party, then bring the club clothes, the big makeup bag, the curling iron, the cute heels and whatever else you need to have a good time. But if your plan is to hike and camp for 90% of your trip, with just a few nights out, then leave them at home. Anything you might only use once or twice isn’t worth its weight in your bag. Arkansas probably wouldn’t break my top 100 places to visit. Not that it’s a terrible place, it’s just not somewhere I ever imagined myself spending time. But last week I had the chance to take a free trip to Arkansas for business, and I just can’t say no to free frequent flier miles, so off I went. Unlike most of my travel destinations, there were no big museums, famous concert halls, large monuments or other well-known sights to see. So instead I looked at this trip as a chance to try some typical Southern experiences. That meant eating a lot of really good barbeque, and shopping at a really big Walmart. The lesson here is that you don’t have to run off to Europe to feel like you’ve really travelled. You just have to go somewhere new to you, and learn a little about what life is like for the people who live there. And if you get a few thousand frequent flier miles out of the deal, even better. I’ve written before that I think travel should include not just the big sights, but the everyday sights, too. So along with the Louvre and the Sydney Opera House, you should also visit a McDonald’s or a laundromat or a neighborhood market. That’s how you get a feel for how the locals live and what their tastes are. And in this case, you also get to see how some cities create art for everyone. You don’t have to be rich to see these creative works. You just have to wander into a subway station. And now, I really need to get to the Place-Des-Arts metro station in Montreal. What’s your favorite train or subway station? Unicorn rentals can be reserved remotely via a really strong wish. This resort features a miniature Loch Ness monster, unicorn rentals, a bathroom mirror that shows you as you looked in 1996, fairy masseuses, a Jell-O moat and monkey butlers. The description is over-the-top enough that you know it’s a joke, but it would still be a fun place to visit… in my mind. I’m going there now. Check out some past travel pranks, like the time WestJet Airlines fooled its passengers by asking them all to help save energy during takeoff by stretching out their arms and flapping. Oh, WestJet. You are currently browsing the Student Travel: Cheap Thrills from Around the World blog archives for April, 2011.